This is a very simple and even vulgar yakitori joint named Sasanoya, which sits along the Yamanote line in Tokyo, near the Uguisudani station a few meters from the railroad tracks. But beyond its food-shack appearance it's a place you have a hard time to resist stopping for a glass of sake (or beer) and a couple of yakitori. Right near the railroad tracks While these love-hotel areas can be considered red-light districts, there aren't dubious characters around, it's perfectly safe and quiet, especially on French standards. If you haven't been in France recently, the law and order situation has been deteriorating steadily along the last few years, making a comparison with Japan is difficult anyway, this latter country looking more and more like another planet in this regard. A recent book on the issue, La France Orange Mécanique, has by the way reached the top 10 best sales in France since january just by the word of mouth. I've heard that it explains in detail how the crime levels have gone bad in Paris and large cities and how the official statistics are off the mark. Didn't read it because I'm all too aware of what I'll find in there and I try to build on more positive vibes. There is indeed some prostitution around these love hotels though, even if these places are mostly for couples, but in Japan it's usually not like, girls going after passerbys, it's very discreet, more like a go-between woman standing in a corner who will tell you which room in which hotel to go, and when in there, if you like the girl, you make a deal... Yakitori grill Again, this yakitori joint is not a sophisticated place, but this is an authentic family fast-food joint that has been in place for ages, my friend T. who has been living in this neighborhood all his life when he was still in Tokyo says that it's always been there, come rain or shine. These yakitori are also very cheap, something a first-time visitor wouldn't think possible in Japan : this venue offers several types/meat of yakitori for only 70 Y apiece, which makes 58 Euro-cents or 74 USD-cents. And there are maybe 5 staff in there, amazing, the taxes and compulsory health-insurance costs must be very reasonable in Japan. Same for the norms which must be more flexible here, that's in large part because of the norms that all our own modest eateries and bars are long gone in our cities and villages. What else do you need ? Put a couple of glasses of sake atop of that, and this will make my day. I wonder why all these expats need to cluster in restaurants and bars in Roppongi or Asakusa when a nondescript neighborhood anywhere in Tokyo offers such hidden treasures. 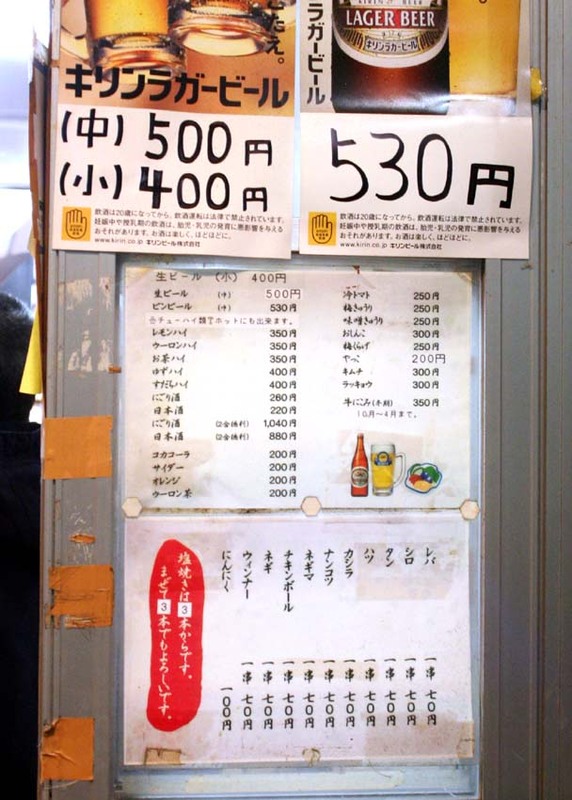 Check this picture for the menu with the drinks and the yakitori (in Japanese though). Satellite view of the building (the turquoise roof near the bottom-center, close to the parking lot). On day time the place looses its magic. Map of Tokyo's love hotels (click on the colored buttons, you'll read the given neighborhood's name on the url). Another picture of the venue, found on the Web. [Edit] : Paris crime : Japanese, Chinese tourists targeted. Thank you so much for posting about this little hole-in-the-wall place! I have stayed in Uguisadani 2 times on my previous visits and I love to pass by here and stand around and eat with all the people...ok and down a sake or a beer as well! I didn't know the name, but thanks to you now I do. I used to just call it 'Mr Grilled Chicken Master's Place' but now I have a reference!